PepsiCo Inc. posted a quarterly profit that beat estimates as price hikes for snack foods and sodas across North America boosted the bottom line and the company sold a minority stake in Britvic Plc a bottler in Britain. 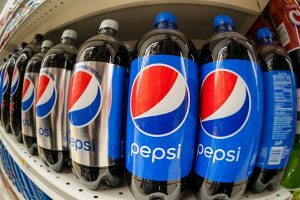 On Tuesday, PepsiCo said that sales for its beverage unit in North America, the largest in the company, were up 2% to end the quarter at $5.24 billion through June 17. At the same time volume sales remained flat, with net pricing 1% higher. PepsiCo and its biggest rival Coca-Cola have been focusing on sales of smaller, higher-margin packages in their developed markets while promoting larger discount packs less, as they try to cushion the impact of dropping demand for all fizzy drinks. Revenue generated by the Frito-Lay North America division of PepsiCo increased by 3%, helped through a volume increase of 1% and a rise of 3% in its net pricing. PepsiCo in May said it would be selling its stake of 4.5% in Britvic the British bottler for an amount that was not disclosed. Attributable net income for PepsiCo was up ending the quarter at $2.11 billion equal to $1.46 a share compared to last year during the same period of $2.01 billion equal to $1.38 a share. Excluding certain items, PepsiCo per share earnings were $1.50. Revenue was up 2.1% to end the quarter at just over $15.71 billion. Wall Street was expecting per share earnings of $1.40 on revenue of more than $15.60 billion. However, PepsiCo’s gross margins were down 50 basis points for the quarter, in comparison with a growth in basis points of 115 for the same quarter one year ago. In April, the company announced that it was expecting its margin for the second quarter to remain pressured as it passed higher prices onto consumers. PepsiCo increased its forecast for adjusted profit for the entire 2017 to $5.13 a share from its original $5.09, citing less impact from adverse foreign exchange. Shares of PepsiCo remained little changed following the announcement of its quarterly earnings Tuesday before the opening of Wall Street. The struggle continues for beverage companies like Coca-Cola and PepsiCo to boost the sales of their carbonated, sugary drinks as consumers shift their eating and drinking habits to food and drinks they consider being much healthier.